Our son, Hayden, lacks one class for his Associates degree, but an opportunity caused him to put his college education on hold. A few years ago, Hayden decided to buy a computer repair business. Not too long after he bought it, a local tv station invited him to appear for a short interview. It was a great opportunity that he didn’t want to pass up, but he began to worry that they would ask him about his education, or more pointedly whether he had a degree in computer science. When he first mentioned his concern to me, I, too, began to fret. Then it dawned on me…Hayden had been studying computer science his whole life. This post contains affiliate links. They don’t affect the price you pay, but help to support my blog. When he was just nine months old I began sitting at the computer with him several times a week. While using a product called JumpStart Baby, he could touch any of the keys on the keyboard to see what would happen on the screen. As he grew, we graduated to JumpStart Toddler, then JumpStart Preschool, and so on, with each level gradually teaching more. By the time Hayden’s sister came along, he was almost four years old and while I was busy with the baby, he was able to start the computer, boot up his software, type in his name and do everything on his own. As Hayden grew up I felt like I saw an aptitude for technology, so I looked for opportunities to nurture it. Hayden had a passion for Legos and played with them throughout his childhood. Somewhere along the way I learned of Lego Robotics groups and wished there was one in our area that he could join. When he was about ten, I decided to splurge and buy him his own kit, thinking of it as an “educational expense.” That turned out to be a good investment. Hayden spent hours every day, for a year and a half, or so, designing robots and programming them on the computer. He built them incorporating different sensors, and started talking to people about gear ratios. He followed his own interests and was totally self-taught. When Hayden was about eleven, I learned that the high school computer science teacher sometimes held Lego Robotics camps. I contacted him and asked if he would consider having one the upcoming summer, and he did. The teacher’s own son, who was an incoming high school senior, assisted for the first few days. When the kids had designed their robot, he helped them program it on the computer. When he was no longer able to be there, Hayden took his place at the computer and helped the other kids. At the end of the camp, Mr. O invited eleven-year-old Hayden to take his high school computer science class. He went so far as to walk me to the Principal’s office to talk to her about it. She wasn’t there, and talking with her confused secretary was amusing, but the result was that the district’s rules wouldn’t allow it since Hayden wasn’t an enrolled student. Alternatively, Mr. O gave Hayden private lessons, teaching him different computer languages and beginning animation. Not too long after that we moved to the Ozarks. During his teens, Hayden started tinkering with his own computers, taking them apart, fixing and upgrading them. When the opportunity arose to buy a computer-repair business, Hayden had been working there long enough to learn the ropes from the owner who was wanting to relocate. He was only twenty at the time, so it would be a big risk and responsibility for such a young man. My husband’s background was in finance. Having worked for Morgan Stanley (previously Dean Witter) for over twenty years, he was talking to an old friend about the opportunity. The friend’s response was that Hayden would learn more from the business than he would with a college degree. We agreed, and with Scott’s expertise in finance, and my experience in advertising and customer service, we felt like we still had things we could teach him and that the business would provide that avenue. Hayden continues to learn through his business. It definitely hasn’t been easy, but we’re proud of him. At one point, he was contacted about installing a new technology for a large company. I was impressed by how confidently he committed to learning it, and negotiated his rates. We asked him if he had any previous experience with the technology, and he said no, but that he could read the manual and figure it out. And he did. It was for Walmart and they hired him to do work for them in five states, installing lockers for their Pickup service. He has also done contract work for McDonald’s, traveling to nearby states to install new technology for them, as well. Once, on a radio program, I listened to a speaker talking about homeschoolers. He said that, in general, they have high self-esteem and are independent learners, and that those traits are beneficial to entrepreneurship. That has certainly held true for Hayden. I don’t know what the future holds for Hayden and his business, but I know that the scope of things he is learning will be beneficial wherever life takes him. Subscribe now to be notified of new posts by Mid-Life Blogger. Learning How to Learn…And Loving It! Really great and encouraging posts for all parents. Our children carry on learning long after they graduate. Thank you for linking to one of my interviews. I am amazed at your son, he should be proud! Thank you for allowing me to include your link. And thank you, too, about our son. 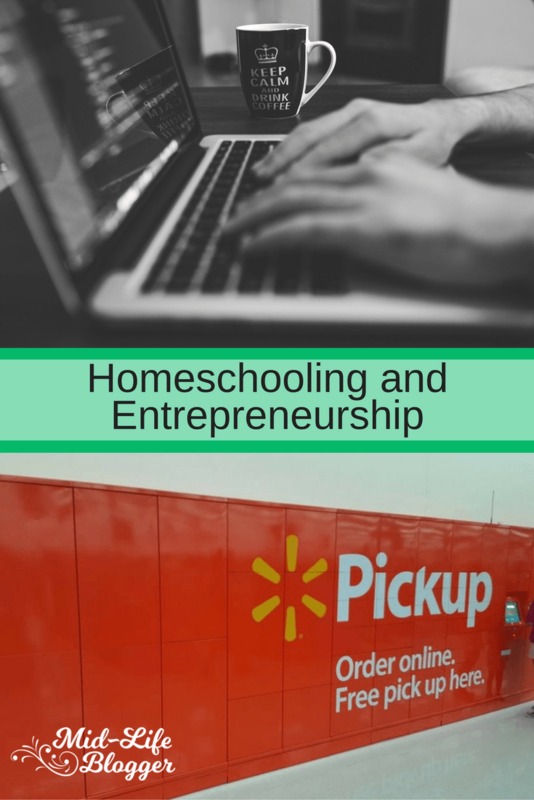 When we first started homeschooling, reading about homeschool graduates was very encouraging to me. I’ve been amazed by the accomplishments of many! When our children are allowed, and given time, to follow their own interests amazing things can happen. Cool story! My kids are still young so this is inspiring to me. I hope I can nurture their individual talents as you have described here. That’s exactly what I was trying to do – encourage. Thank you! Someday you’ll be sharing your stories, too. Way to go Mom! LOVE this. Thanks for the encouragement. Thank you, Shan! Homeschoolers all take different paths so I hope to encourage those who are earlier in their journeys, still wondering if it’s going to work, and trying to persist in spite of their fears. I remember what it was like when my kids were young. Hearing about the graduates was very inspiring to me. It sounds like your son has had a great education! My own sons have done similar things with LEGO robotics and loved it! I’m a Legos fan. They’re a great, classic toy. I’ve kept my kids’ for future use. That is such a great story! The freedom to allow our kids to follow their own interests, and to encourage them in areas we see they excel, is one of the best things about homeschooling! I totally agree. It can be kind of scary, while you’re homeschooling, to leave the beaten path and forge your own trail. I hope my son’s story can be reassuring and encouraging to other homeschool families. Wow! What a fantastic “testimonial” to the benefits of homeschooling! Thank you, I hope it will be encouraging to other parents. When kids are permitted to pursue their passions, and have the time to do so, you never know where it will lead. Read my post, “A Passion for Seeds” for another such story. What a great testimony! I love hearing success stories the do not fit the typical mold. How wonderful that you were given encouragement and reassurance from others as you took those steps of faith educating your son. Thank you for sharing this with us. It helps so much to read about the path others have walked. Thanks! I hope so. I think that’s one of the worries that some parents have, so I wanted to share a different story. Love this 🙂 Our youngest was actually able to compete on a robotics team that used lego mindstorms. They won all three of their tournaments this year which was so fun, but my favorite part was seeing how well they worked together as a team. For anyone who has the opportunity, check it out! Congratulations! That’s wonderful! I still wish my son could have participated on a team like that. I think he would have loved it and learned even more.